Our 'tried 'n true' CLASSIC Tees from Sea Breeze are here in soft Baby-Rib Jersey Knit with 3/4 Sleeves and V-Neck. S, M, L, XL. They have just the right balance of fit and drape to please the most discriminating Tee-lover. One will simply NOT be enough. Falls to high hip. 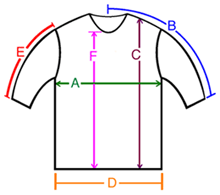 A: Chest / Bust circumference 39" 41" 43" 44"
B: Sleeve length from center of neck to end of sleeve 23" 24.5" 24.5" 24.5"
C: Body length from shoulder to bottom of hem 23" 24" 24.5" 24.5"
D: Hem circumference 37" 38" 41" 41"
E: Sleeve length from shoulder to end of sleeve 15" 15.5" 16" 16"
F: From the bottom of the V-Neck to hem 17" 18" 18" 18"
It's the right bright shade of red, it's a V-neck, it has hip coverage, and the price is ridiculously right--what more needs to be said? It's just what I was looking for! I'm ordering another one. I love this top! It is one of the best-fitting, and longest-lasting in my closet. I wear it all the time, and even use it for a pajama top when traveling. It washes beautifully. I'm back for a third color.